Hotels in north Phoenix are concentrated along the I-17 corridor, with a secondary location a few miles east around the Loop 101 - Hwy 51 intersection. Two shopping malls along the interstate are Freeway Plaza at the Bell Road intersection and Happy Valley Towne Center 5 miles north, right on the edge of the developed part of the city. Adjoining cities are Anthem to the north, Scottsdale to the east and Glendale/Peoria to the west. 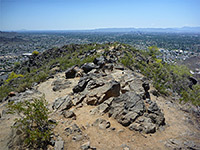 There are several desert preserves close by to the north, including Cave Creek Recreation Area and Phoenix Sonoran Desert Preserve, plus a selection of smaller parks within the urban neighborhoods such as Lookout Mountain Preserve and the North Mountains. From the intersection of Loop 101 and I-17, downtown Phoenix is 15 miles south, and the international airport 7 miles further. Regarded by many as the best hotel in the Phoenix/Scottsdale area, the 950 room/suite JW Marriott Desert Ridge Resort combines luxurious accommodations, high quality customer service, comprehensive facilities and a scenic location to create an unforgettable guest experience. The resort has a quiet, rather remote location on the north side of the 101 freeway, surrounded on most sides by undeveloped Sonoran Desert plains, and with the McDowell Mountains rising up a few miles east. A shopping mall with several restaurants is located a short distance south, though all necessary facilities are available on site; hotel highlights are a full service spa, five swimming pools (including a lazy river), ten restaurants, a championship golf course and 200,000 sq ft of meeting/event space. Marriott's Canyon Villas is part of the JW Marriott Desert Ridge Resort, located right at the north edge of Phoenix near the 101 Freeway; the hotel offers a range of luxury accommodation including standard rooms with a kitchenette, and one or two bed villas all with a full kitchen & private balcony. Rooms are divided into several blocks surrounded by landscaped gardens, next to a golf course and bordering untouched, saguaro-studded Sonoran Desert land in some directions. Shopping and dining is available one block south at the Desert Ridge Marketplace, and guests can use all the many facilities at the adjacent Marriott resort, for no additional charge. Recently built Courtyard Phoenix North is part of the expanding Happy Valley area, containing shops, restaurants and new residences located right at the north edge of the city either side of I-17 - access is from exit 218, 20 miles north of central Phoenix. The hotel is far enough from the interstate for its 164 rooms & suites to offer a quiet night's sleep; all accommodation is very large and well appointed, with amenities including a sofa bed, plasma TV, free internet access and luxury bedding. The hotel has a cafe open for breakfast only, plus other facilities of a business center, meeting space fitness center, hot tub and a large outdoor pool, shared with the adjacent Residence Inn. The all-suite Residence Inn is the smaller of two adjacent long stay Marriott hotels just off Happy Valley Road on the north edge of greater Phoenix, within walking distance of the new Shops at Norterra Mall and half a mile from I-17 exit 218. The pet friendly hotel features spacious, modern suites in studio, one bed or two bed configurations, all equipped with a full kitchen including refrigerator, dishwasher, stove, dining table and microwave. Guests are treated to free full breakfast each morning a free manager's reception weekday evenings, when snacks, beer & wine are served; also available are a sports court, fitness center, outdoor pool, whirlpool, laundry, business center and a 15 person meeting room. The fully featured, extended stay Residence Inn Phoenix Desert View opened early 2009, adjacent to Mayo Clinic on the north edge of Scottsdale/Phoenix, bordered by untouched desert lands in most directions. Access is from Loop 101 which runs past just to the north. The combination of excellent customer service, the spacious and well equipped suites (all with a full kitchen), the good facilities and the free hot breakfast positions the Residence Inn near the top of the hundreds of hotels in Phoenix; other amenities include an elegant lobby, an outdoor pool (plus cabanas), a courtyard/patio with fire pit, a fitness center, a putting green, a business center and meeting space. The fully featured, resort-style Embassy Suites Phoenix Scottsdale has a particularly impressive location beside a small lake, overlooking the greens and fairways of the Stonecreek Golf Course, in a generally residential neighborhood yet within walking distance of Paradise Valley Mall and its associated restaurants & entertainment centers. The 270 comfortable suites all include one bedroom, a kitchenette, a work desk and a separate living area; most have a private balcony. Complimentary breakfast is cooked-to-order each morning, and evening receptions are also provided free of charge; other meals can be ordered from the on-site restaurant (Tatum's, open for dinner and lunch). Meeting/event facilities are also comprehensive, with over 14,000 sq ft of indoor & outdoor space; largest single capacity is 700, theater configuration. The northernmost of several Homewood Suites by Hilton hotels in Phoenix has a quiet location just east of I-17, set back a way from the highway next to a new residential development. Also nearby is a Wal-Mart and several other large stores, plus a selection of restaurants; this location is almost at the north edge of Phoenix, accessed by the Happy Valley Road exit of the interstate. The recently built hotel has earned a good reputation for its spacious, comfortable and well equipped accommodations, which comprise studio, one bed or two bed suites all with a full kitchen. Free hot breakfast, free weekday evening reception, a fitness center, business center, boardroom and outdoor pool are some of the other amenities. Hilton Garden Inn Phoenix North Happy Valley enjoys an easily reached yet quiet location - just 0.7 miles from Interstate 17 (Pinnacle Peak Road exit), but set back a little from the main road, adjoining a business park. Happy Valley Towne Center is just over a mile north, and Phoenix Deer Valley Municipal Airport is 2 miles south. The elegant, modern hotel has its own restaurant, open for breakfast, lunch, dinner & room service, plus a bar, while the in-room microwaves and refrigerators allow guests to prepare their own meals, purchased from the 24 hour convenience store. The business center is also open all day. 200 guests can be accommodated in the main ballroom. The 125 room/suite Hampton Inn is one of the northernmost hotels in the Phoenix area, located in the developing Happy Valley district; on the east side of I-17 half way between exits 217 and 218, next to a Hilton sister property (the Homewood Suites). Both hotels are new, clean, well managed and nicely decorated; the Hampton Inn offers complimentary amenities of wi-fi, hot breakfast and a 5 mile radius shuttle, to such locations as Phoenix-Deer Valley Airport and Deer Valley Village, around the 101 Freeway intersection. Guests are also adjacent to Happy Valley Towne Center, with many restaurants and several large stores including Wal-Mart. The hotel has an outdoor pool, business & fitness centers, and a 40 person meeting room. The Cambria Hotel adjoins the Desert Ridge Marketplace in north Scottsdale, which contains many stores and restaurants, and an 18 screen movie theater. Also in the vicinity are Mayo Clinic Hospital, the Desert Ridge golf course and Paradise Valley Park; these and many other places are within range of the complimentary, ten mile radius shuttle. Guest rooms feature a work desk, refrigerator, sofa bed, microwave and free wi-fi, while the hotel has a fitness center, meeting space, an outdoor pool and a restaurant/bar. Route 101 runs past to the south; access is from the Tatum Boulevard exit. Holiday Inn Express Phoenix North opened fall 2013, built at the edge of scenic desert plains on the north side of Loop 101 near the Tatum Boulevard exit - 8 miles east of Interstate 15 and 14 miles north of downtown Scottsdale. Guests are within a short walk of Desert Ridge Marketplace which contains around ten restaurants; buffet breakfast is available free at the hotel, however, including a selection of hot items. The 104 room/suite hotel offers all the necessary amenities: outdoor pool, hot tub fitness center, business center, meeting space, guest laundry and convenience store. Like most north Phoenix hotels, the Fairfield Inn by Marriott faces interstate 17 - situated next to a Best Western on the east frontage road by exit 212 (Bell Road), on the opposite side to the Bell Canyon Pavilions mall, which has many restaurants and specialty shops. Rooms are simple, bright and clean, equipped with microwave/refrigerator, large work desk, ironing facility and a coffee maker; other hotel amenities are a nice outdoor pool area with sundeck and hot tub, free hot continental breakfast, basic business services, and guest laundry. Rooms at the Sleep Inn North provide clean, quiet, relaxing and affordable lodging, in a nice, new building between I-17 and 27th Avenue, close to the north edge of Phoenix. There are many shops & restaurants a few blocks away by the 101 Freeway intersection, and the Bell Canyon Pavilions mall is 1 mile to the south. Services at the 61 room hotel are the expected free breakfast (continental), exercise room, outdoor heated pool, hot tub and guest laundry. Studio 6 Phoenix - Deer Valley provides budget priced, all-suite/extended stay accommodation with limited facilities; a full kitchen in every room, plus wi-fi, laundry, cable TV and free coffee. Rooms are divided into several blocks surrounded by the ample parking lot, in a mostly residential area of north Phoenix next to Interstate 17 (exit 214A; Union Hills Drive). The nearest shopping center is Freeway Plaza, 0.8 miles south, while businesses in the neighborhood include University of Phoenix, Honeywell and Vitron Manufacturing. At the Deer Valley Road exit of I-17, the Days Inn is an affordable, modern, interior corridor property with a quiet setting, 100 feet from the interstate and set back a little from the main road. Adjacent businesses include three restaurants and a gas station; a better choice of dining and shopping can be found one mile south at Deer Valley Towne Center. The motel has a little outdoor pool/hot tub at the front, while interior facilities are coin-operated laundry and a dining room for the free continental breakfast. Centerpiece of Motel 6 Phoenix North is the courtyard garden and outdoor pool, enclosed on all sides by the two story accommodation blocks, which have plenty of parking spaces around the perimeter. The motel faces Bell Road (north side), just east of I-17 exit 212. Metrocenter Mall is 4.5 miles south and there are several smaller shopping centers close by, and plenty of restaurants in the vicinity. Apart from the pool, the only amenities are wi-fi, laundry and free coffee.